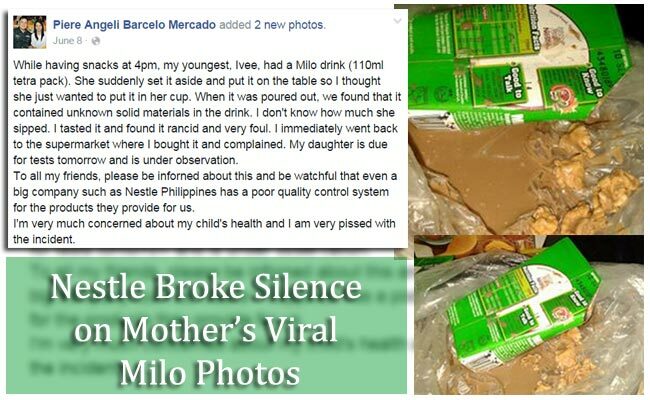 Nestle Philippines finally broke its silence on the photos of Milo Ready-to-Drink tetra pack going viral on Facebook. According to the person who owns the photos, she found solidified matter inside the famous drink. The photos had been posted by Piere Angeli Barcelo Mercado last June 8 and was shared by Facebook users for more than 8,000 times. According to the description accompanying the photos, Mercado’s youngest child, Ivee, was drinking the chocolate drink and suddenly left the drink on the table. Thinking that her daughter wants to pour the chocolate in the cup, she opened the pack and poured out the contents. She found solidified matter in the drink and claimed that the smell was rancid and foul. She immediately went to the store where she bought the drink and took her daughter for tests the next day. Mercado shared that she was pissed with the incident and contacted the Nestle Philippines and gave them samples for laboratory tests. In an official statement released by Nestle Philippines concerning the said incident on her MILO Ready-to-Drink 110 ml, their Quality Assurance tests had showed that the solidified matter was actually a coagulated milk. Air and heat could have caused milk to spoil and solidify. To know what could have caused the abnormality in the manufacturing process, the Quality assurance experts compared the product with the same batch code kept in the factory for reference. The tests had showed that the reference products are all normal and no coagulation was found. Nestle claimed that there was a small incision found in Mercado’s tetra pack, but there was none in the reference products. With this, it was concluded that the incision happened outside the factory. The company claimed that they personally met with Mercado and her husband to explain the test results. However, in her post on July 28, Mercado claimed that the University of the Philippines Microbiological Research and Services findings is rather different. UP said that the foreign matter is a mass of fungal hypae. 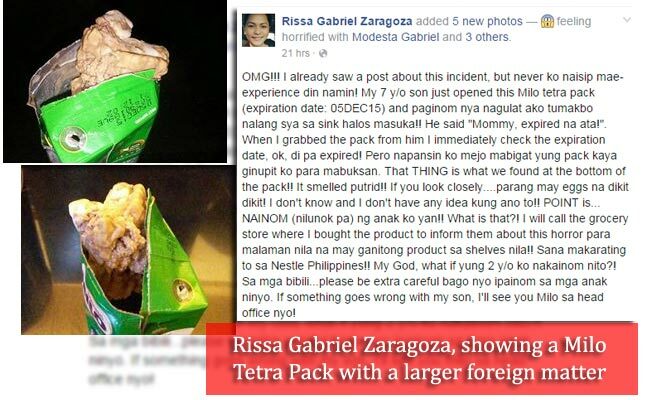 There was also a recent Facebook post of another mother, Rissa Gabriel Zaragoza, showing a Milo Tetra Pack with a larger foreign matter that the one posted by Mercado. Zaragoza claimed that the expiration is still due on December 5, 2015, yet the drink seemed spoiled and rancid. Nestle had no statement on this incident, however, Zaragoza’s post was soon deleted on Facebook.